Judy is the proud mum to Jamie and Andy, both Wimbledon champions, former World number ones, and roles models to the tennis community. Judy also captained the British Federation Cup team and is a former player herself, who amassed 64 titles in her native Scotland before briefly turning professional. She’s also coached many players at regional and national level as part of the Lawn Tennis Association’s programmes. Kris works with Judy on her Tennis on the Road programme. 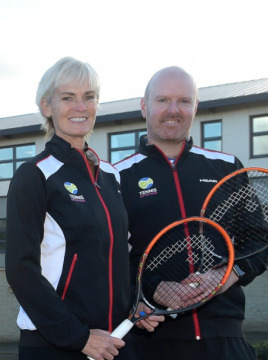 A full-time tennis coaching professional for 25 years, Scotland-based Kris holds the highest LTA coaching qualification, the Master Performance Coach, designed to help players win matches at international level. Kris, is a former member of Judy’s National Coaching Team and has developed Scottish and British champions as well as players with Tennis Europe, ITF and ATP/WTA world rankings. Kris has also worked as an international high-performance tennis consultant in the USA, presented at UK national coaches’ conferences and won multiple awards for his coaching.